Having small apartments is a very common problem that many people have,but there are many solutions to enjoy having a small apartment. If you are having difficulty in setting your furniture in small apartments, then there are 10 top space-saving delicate furniture which you must have. A nightstand that is attached to the wall is perfect to save some space. These nightstands gives you the same function and takes no space.You can use the space underneath the Nightstand for shoes and books.These Nightstands are fixed on the wall and have no chance of falling. They are pretty easy to clean and manage too. These transforming table designs might seem dull at first but they save space for many other things. You need not to flip-up, fold-down, spin-around secrets, just simple sliding is done to increase or decrease the dining.They can be placed anywhere. How nice if you can combine, table, cable and storage rack into one? This particular designer has come up with mind blowing design of combining 3 furniture into one. Wanted to purchase a gym equipment but don’t have space in your small apartment? You might want to consider this compact gym cupboard. Beside serving as storage place, you can workout your body easily with various exercise using this piece of furniture. Want to have your own personal office but there is no place? You can consider having this cupboard/work station for your perusal. It might look like a harmless cupboard, but with a few adjustment, you will surprise that the cupboard actually transformed into your own personal work station. Working at home will be more fun from now onward thanks to this. If you really have limited space in your apartment, you can try combining your kitchen and bathroom into one. On your left will be your kitchen where you can prepare light meals and on your right you can have your compact bathroom. The designers even claim this design conserve water and energy by recycling used water. Many people dream of owning their own bar island but small apartment space prevents them from doing so. With this portable bar, you can solve this problem and hide your bar in plain sight. When activates, this cupboard will transform into your own personal bar to serve fine wine to your guests. 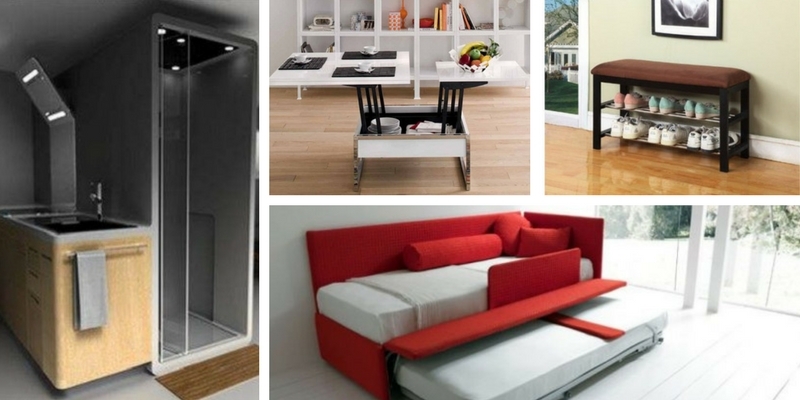 This common space saving furniture is used widely for small apartment owners who want to conserve space. It has dual purpose as a sofa and as a bed. When explore further, you can find an additional guest bed below of the sofa bed for your friend or family member who is staying for the night. Is your ironing board giving sore eyes for your current home decoration? If yes, you can try install this mirror ironing board for your home. It might looked like a harmless sleek mirror, but when you open it up, it will reveal a nice ironing board for you to iron your clothes. Say goodbye to your ugly ironing board that you can’t find at plain sight. Many house owners have a common dilemma in determining which shoe rack to get while providing the comfort when wearing your shoes.